With Windows 8.1, we are introducing wireless display developed on the Wi-Fi Alliance (WFA) Miracast wireless display specification, so you can now wirelessly project to a big screen without fussing with proprietary technologies, network access, and different display cables and adapters. Wireless display is available in new Windows 8.1 PCs – laptops, tablets, and all-in-ones — allowing you to display your full Windows 8.1 experience (up to 1080p) to large wireless display-enabled screens at home and work. Although it can be handy to turn your device into what is essentially a touch-screen remote control for watching online videos, we knew the potential was there to do a lot more when you wirelessly project your Windows device to the big screen. In Windows 8.1, wireless display is a great way to share anything you do on Windows with friends and family in the living room, with colleagues in the conference room, and with students in the classroom. It lets you share experiences like shopping on Amazon or eBay, checking out 360-degree panoramas of vacation destinations in Bing Travel , solving puzzles in Disney Fairies with the kids, enjoying photos from a class field trip on SkyDrive, or exploring the solar system with your classroom with the World Wide Telescope. Of course, you can also use it for watching movies and videos through your favorite services like Netflix, Xbox Video and YouTube. Wireless display puts Windows 8.1 on your big screen. 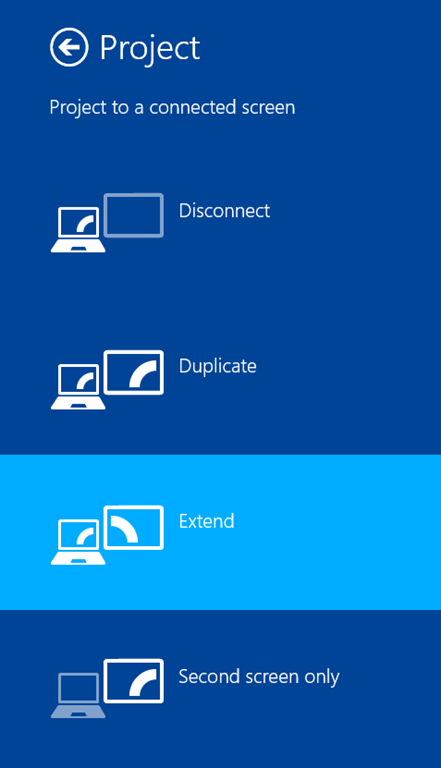 With wireless display in Windows 8.1, you can duplicate your main display or extend your display, giving you two independent screens (multi-monitor). Duplicating the display takes what you have on the local screen of your device and shows it on the big screen. Extending your display allows you, for instance, to use Microsoft PowerPoint to show a presentation in Presenter View, where the local screen shows you your speaker notes, next slide, and slide controls, while the wireless display shows the audience your full-screen presentation. Great for when you want to come from behind the podium, while keeping your notes and controls in the palm of your hand. When you use wireless display, you have a source and a receiver: your Windows 8.1 device is the source, while your TV or projector is the receiver. If your display already has Miracast support, you are ready to go. If not, Miracast adapters provide an economical way to add wireless display to your existing TV or projector. Wireless display works on new Windows 8.1 wireless PCs. This includes Surface 2 and Surface Pro 2, Nokia Lumia 2520, and Intel Atom Generation 3 (“Bay Trail”) and Intel Core Generation 4 (“Haswell”) systems. Some PC manufacturers have also added wireless display to some of their systems that originally shipped with Windows 8. This includes the Surface Pro and many systems based on Intel Core Generation 3 (“Ivy Bridge”) and Intel Wi-Fi. Be sure to check for updates from Windows Update and from your PC manufacturer, including driver updates listed as Optional, when determining whether your PC manufacturer has made wireless display available on your upgraded Windows 8 device. As I mentioned earlier, we built wireless display on the Miracast industry-standard specification, which the industry based on widely adopted standards such as 802.11n, Wi-Fi Direct, and H.264/MPEG-4 AVC. We believe working with the industry and using industry standards allows broader adoption and interoperability by source devices (e.g., laptops, tablets and phones) and receivers (TVs, projectors, streaming players), and over time allows the standard to advance beyond any one company’s interests. We worked with several Miracast receivers during Windows 8.1 development. Notable among these are the ActionTec ScreenBeam Pro and the Netgear Push2TV (PTV3000). These and other Miracast receivers work great in bringing Windows 8.1 to the big screen. Additionally, ActionTec simplified firmware updating and configuration for their receiver by creating a Screenbeam Windows Store app using our new Wi-Fi Direct APIs (Windows.Devices.WiFiDirect). Whichever Miracast receiver you choose, be sure to update to the latest firmware for best results. Note: ActionTec is providing readers of the Windows blog a 15% discount on the ActionTec Screenbeam Pro through their online store now through the end of this year (12/31). Please use the Screenbeam Pro links in this blog post to receive the discount. To get started with wireless display, first ensure that your Windows 8.1 device is ready by checking Windows Update and your PC manufacturer for any driver updates, including drivers presented as optional. After your machine is ready, you need to add your wireless display receiver for the first time. To add it, open the Devices charm by swiping in from the right and then tapping Devices (or if you’re using a mouse, point to the lower-right corner of the screen, move the mouse pointer up, and then click Devices.). Select Project and then Add a wireless device to have Windows scan for available Miracast receivers. Note: Wireless display is available on most new Windows 8.1 PCs, but some PC manufacturers might choose not to include it on some new and upgraded PCs. Specifically, your PC needs WDDM 1.3 display and NDIS 6.4 Wi-Fi drivers, enabled by the IHV and OEM for Miracast. If you don’t see “Add a wireless display” when you tap the Devices charm and tap Project, try going to Windows Update and downloading all available updates (including optional drivers). If you still don’t see it, check for additional updates on your PC manufacturer’s support site, or contact them to ask how you can get this feature on your PC. Selecting your receiver begins the secure pairing of your Windows 8.1 device to the Miracast receiver. After pairing is finished, you’ll be able to project your full Windows 8.1 experience wirelessly onto your big screen. To extend projection, open Devices and tap Project again (or press Windows key + P), and then tap Extend. To end projection, open Devices and tap Project again (or press Windows key + P), and then tap or click Disconnect. The next time you use your wireless display it will be even simpler, as Windows remembers the displays you’ve used, and automatically shows them whenever they’re available. Simply open Devices, tap or click Project, and then tap or click the display you want. The Project to a wireless display with Miracast article provides info about source and receiver setup, how to project to the receiver, and troubleshooting problems. What do app developers need to do? App developers do not need to change their apps to take advantage of wireless display. By default, all apps will just work with wireless display. We do however provide the ProjectionManager APIs, for developers who want to provide an enhanced experience with wireless display. ProjectionManager APIs allow an app to detect a secondary monitor, and when the monitor is present, control what the app displays on the primary and secondary monitors. An example is a video or photo app, where the local screen shows the box shots, thumbnails, or playlist, while the wireless display shows the full-screen video or slide show. A game developer could provide controls for the game on the local device (e.g., cards in hand, steering wheel and cockpit controls) while the wireless display shows the action of the game on the big screen. The ProjectionManager APIs are not specific to wireless display and work equally well for wired monitors. In either case, wireless or wired, what gets displayed on either screen is up to the app developer. For those interested in the nitty gritty of how wireless display works, here’s a quick rundown. It begins with the discovery of available Miracast receivers, and then proceeds to establishing a point-to-point connection between the source and receiver over Wi-Fi Direct. Security is negotiated using Wi-Fi Protected Setup (WPS), with communication secured using WPA2-AES directly between the Windows device and Miracast receiver. Once communication is established (2.4GHz by default or 5GHz if pre-connected to 5GHz AP), the source and receiver negotiate capabilities – e.g., the resolution and refresh rate (e.g., 30Hz), content protection scheme, audio channels, etc. Once capabilities are agreed, Windows begins projecting its display and audio onto the remote device by encoding the local display and sound, and sending to the receiver, where the receiver decodes and displays. Anything your Windows PC has access to, you can wirelessly display on your big screen. This is, of course, just a high-level explanation of the steps involved, with the Wi-Fi Alliance Miracast site having more details including the full specification. There are other wireless display (“screen casting”) alternatives, each having their own advantages and drawbacks when compared to Miracast. Not all alternatives support full HD (1080p) and instead top-out at lower resolutions below what your TV/projector may natively support. Some of the alternatives work well in home environments, but have difficulty in corporate and hotspot environments where the receiver has to authenticate onto the network using enterprise-grade security such as WPA2-Enterprise or hotspot style authentication using a captive portal. Miracast is different, in that it is peer-to-peer, going directly between Windows and the receiver, and not over the Wi-Fi infrastructure network. This means that you can allow a guest (corporate or home) to project in your conference or living room without you having to grant them network access (which could potentially give them access to other devices and content beyond what you might have intended). With wireless display, you’re only granting them access to the display… not to your network. Since the content comes from (or via) the Windows device, only the Windows device needs Internet access, which can come via its Wi-Fi, mobile broadband, or wired connection. Additionally, since we enabled wireless display in the OS and not tied to any particular application, any content in any app can take full advantage of the processing power of the PC, which enables a good wireless display experience across the range of Windows 8.1 devices and form-factors. We are excited to have worked with our partners and the industry in bringing you a great, no compromise, and standards-based, approach to wireless display. We look forward to hearing about your experiences as you project your full Windows experience onto the big screen! Please let us know your thoughts by leaving us a comment.